Dogtime‘s Road to Rescue program salutes Michigan’s A Better Place animal rescue. Our founder devoted approximately 20 years undertaking various animal welfare and education projects, from managing shelter/rescue groups to helping author the spay/neuter laws in Michigan. Through these experiences she developed an education and rescue program that creates excellent opportunities for the animals. A Better Place is a Michigan-based 501(c)3 non-profit organization that was established in 2005 to implement this program under her guidance. 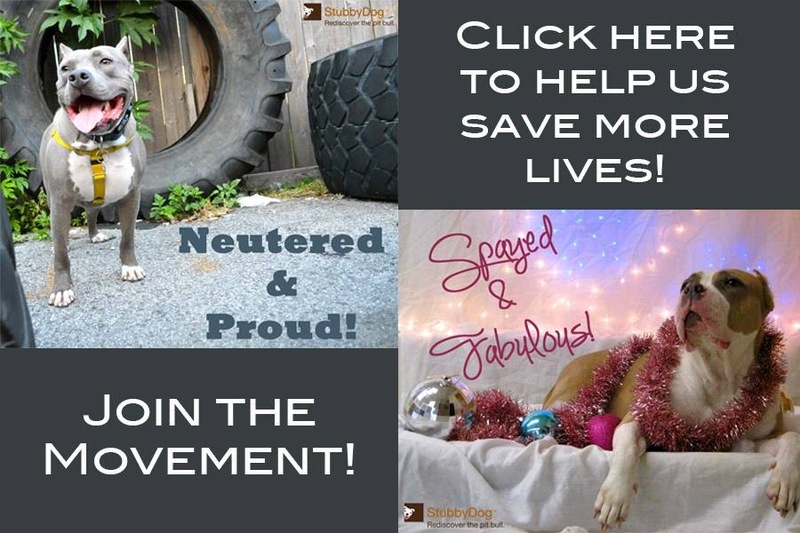 Basically: Educate, Spay & Neuter, Rescue! Our mission is to provide companion animal education, promote and provide spaying and neutering of pets, and continue rescue work to make the community "A Better Place." We strongly believe that the people in the community make the difference and that education is the key. A Better Place offers a beautiful life for pets that have been thrown away by previous owners. A Better Place networks with other rescues to make sure no dog dies inhumanely in the gas chamber in their community. All adoptable animals are put into rescue programs for adoption. No animal is turned away for need of vet care. A Better Place cooperates with a network of Michigan dog rescues, aiding in the rescue of animals from many Michigan communities. We concentrate first on those who either sell animals for medical research or use inhumane gassing for euthanasia. Due to the ailing Michigan economy we have also taken in many owner surrenders. All of our animals receive the following basic vet care prior to adoption: rabies vaccination, blood panel, spay/neuter, heartworm prevention, deworm, deflea, and two sets DHLPP. A Better Place also provides any additional vet care necessary. Four out of five of our animals need additional vet care when they come to us. This vet care is completed prior to adoption and is included in our standard adoption fee. Recently, in addition to basic care, we have treated five heartworm positive dogs, a broken leg, removal of an eye, pneumonia, three females with pyometra, and other miscellaneous infections, wounds and injuries. We believe that long-term kenneling is unhealthy for the animals, therefore A Better Place has volunteer foster families who care for the dogs until a forever home is located. Even after spending years on a chain and being ignored, this beautiful girl still has such love, trust, and devotion that it will take your breath away. 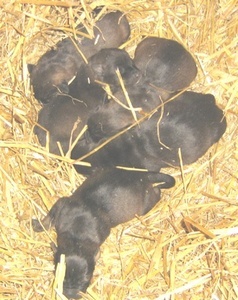 Destiny gave birth to a litter of pups outside on one of the coldest nights this winter (January 13, 2009). Thankfully, due to the intuition of one of our volunteers, Destiny and her pups were rescued just in time. Unfortunately, two of the puppies froze before we found them and one died shortly after. Even though Destiny was about frozen and scared, she let us reach right in and rescue her and her surviving babies from the cold doghouse. She knew they were going to A Better Place. Everyone who meets Destiny falls in love with her big heart, warm eyes, and super sweet kisses. You can’t be around her and not want to hug her–try it, we dare you! She’s been such a great momma, she deserves a fabulous forever home where she will be recognized for the true treasure that she is. All of the pups received age appropriate vet care. All but one of Destiny’s pups have been adopted into forever homes. Destiny is currently being treated for heartworm. 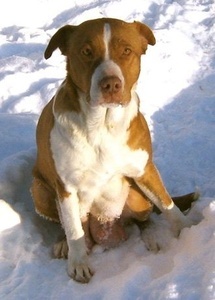 Destiny is approximately two years old, up-to-date on her shots, housebroken, and will be spayed prior to adoption. 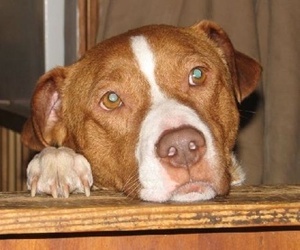 Destiny is currently in a foster home awaiting news about a possible forever home. Note: Destiny has since been adopted, however, A Better Place has many more adoptable dogs.